Our spa specials for the month of May put the focus on taking care of the women who take care of us all year round! Treat Mom to a full manicure and pedicure with a moisturizing masque and 20-min massage. $135 in May only! Give the special lady in your life the gift of our popular massage/facial combo treatment, which combines a 45-min massage and a 45-min uplifting facial. $155 in May only! Pricing on May specials only valid until May 31st, 2014. All facials now exclusively feature award-winning 100% organic Éminence products. 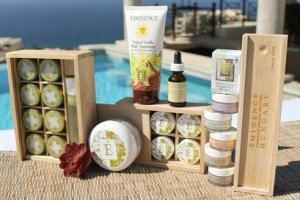 The Éminence Skin Care Line uses only the best natural ingredients, so they’re better for your skin and the environment! For more information on our products and services, please check out our Facebook page, Twitter and Pinterest! Note: Rates do not include the 18% gratuities and the 16% taxes. A minimum of services is requested for all in-villa spa services depending on availability and season. A traveling fee may apply for services outside Cabo San Lucas, the Corridor and San Jose del Cabo. All reservations starting before 8am or after 7pm will be subject to a 30% after-hour fee. Price are per person unless otherwise noticed and in US dollars. These promotions can not be apply with any other promotion. Credit card payments Visa and Mastercard accepted. This entry was posted in Blog and tagged Cabo mobile spa, Cabo spa special, May spa specials, Mother's Day in Cabo, Mother's Day massage in Cabo.